There are several. The primary one is between the protagonist and his father, but there are relationships between other sons and that father, that father and his own father; that father’s father makes a brief appearance; add to that the relationship of a Father Heavenly to any of the other characters, and potential surrogate fathers, and we have a complicated web of nurturing male relationships. But, at least on the surface, the primary relationship never ceases to be the protagonist and his father. The protagonist son was traumatized in a swimming pool at a young age by . . . someone . . . only to be rescued by his father. “”It’s all right, Carlie, I’m here. He’s gone. It’s all right.” That experience led to a fear of water, which prevents him from being baptized at age eight. His father, who, from his own age of eight has been refusing to be baptized and who declares a greater affinity for earth than water, gradually teaches his son to swim and not to fear the water. Which leads to Carlie’s baptism at age ten. A move his father inadvertently prepared him for, and, ultimately, serves as a symbolic separation between them. Yet as the son experiences the sublimity of his new relationship with a different Father, his earthly father interrupts his musings to take him to the mountains to check on his hired sheepherder and his sheep. What surprised him was his father’s face, that it was without revulsion yet without pleasure too, except the satisfaction of having done the thing neatly, the same as when he oiled some kid’s squeaky tricycle or got the water regulated in all the furrows of the garden. What surprised him more was himself, that he too felt this a matter of fact, a kind of work, new, but after the first startling slash of the knife just something to see and do. But it was death and it would feed them. They eat the yearling lamb and are filled. The story does not end there, and the two grow closer and closer till they stand together on the edge of the world, take it all in, and declare it good. The story has much more to offer. Go, return, report. I really like this. I mean, yeah, it’s well-crafted, although by now I’m beginning to long for stories that aren’t set in rural Utah and (ideally) don’t involve dead animals. More meaningfully to me, though, are the characters, well drawn and intimately likeable. Coming to this story after having read Doug Thayer’s “Opening Day” is an exercise in contrasts. Thayer’s story is one of fallen man, of human society in opposition to God’s. Jorgensen’s story, in contrast, is one of reconciliation: the good country of Carl’s unbelieving father and his mother’s kingdom of God on earth ultimately one and the same, if seen through different eyes. The day of the story, Carl is baptized into both. The more I think about it, the more stunningly hopeful it is. Even the style seems friendlier than Thayer’s, less sharp and chiseled though no less well crafted. 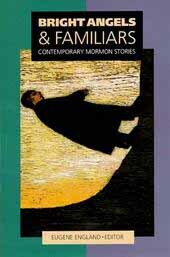 If Thayer is a Mormon Calvinist in his writing, Jorgensen is a Mormon Unitarian. We’re privileged to have both. I couldn’t agree more. From the rural Utah complaint to the final praises.